Successful researchers know easy tricks to evaluate websites at first glance. Follow the acronym ADAPT to evaluate any page you think might be useful. A: How accurate is the information? Can you verify it elsewhere? Is the site free of typographical or spelling errors? D: Depth matters. Does the site offer a sufficient depth of information or just pieces that can be misleading? A: Who authored this site? Can you contact them for more information if needed? Can you verify the site owner’s authority on the topic? P: What is the purpose of the site? Is this a blog or a fact based page? Check the domain extension (.edu and .gov will likely be legitimate). Be skeptical of sites with big or varied fonts, multiple bright colors, or excessive punctuation. T: Time is important. How new is the information? If there are no dates listed, look for other clues. Don’t mistake the date the page was created for the date that the information was obtained. Still not sure? Check out this helpful website credibility guide from EasyBib! It’s okay to use Wikipedia to find general information on a topic, but don’t stop there. Using Wikipedia as an official source for a research paper is a bad idea because not all of the information you can find there is verified and reliable. A lot of it is, but not all. If you find a good Wikipedia page, be smart and check the works cited at the bottom of the page. Follow those links and using your web evaluation skills, find more credible sources and use those for your research. 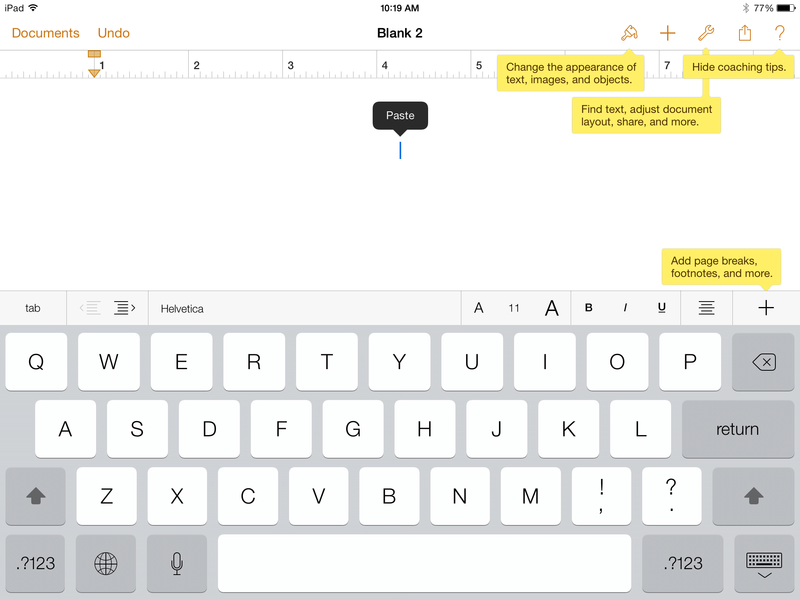 This tip will help you when you’ve done your research and are ready to put everything together using Pages on your iPad. Part of creating a good research assignment is presenting your findings in a professional looking document. Pages has a great tool to help you do just that called COACHING TIPS. To turn this feature on, tap the ? on the top right corner of your document. You will see yellow dialogue boxes that will show you where to find formatting options. Coaching tips will help you find everything you need from changing font size to inserting tables. Ummm… where did it go? Imagine this—you found an awesome website in your research, but skipped past it and can’t find your way back. Use your browser history to save the day. Here’s how to access your browser history on the iPad. Your iPad can be a great research tool. Whether searching online in class, at home, or on the go, it provides an easy way to access tons of information. Unless you have a keyboard, retyping to correct mistakes can take more time than you might like. 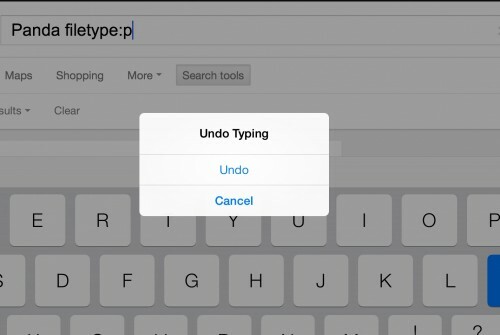 Thankfully, our friends at Apple have created a simple shortcut to undo/redo your last typing action. Simply give your iPad a quick shake after typing or erasing type and an undo/redo menu will pop up. Scanning to look for a specific word or phrase on a website? On a desktop or laptop computer, type [CTRL+F] to activate the search function on a site. 1. Tap the search field. 2. Enter the word you are searching for. The Google suggestions will appear but beneath them it will say [on this page] and you can tap that to run a word search. ***There is also a [search on page] box that appears above your keyboard when you type your search term. UPDATE: this pic is from iOS 7, but the functionality is the same! Have you ever searched online and found almost the right information? Reverse Linking is a good strategy to dig deeper within a search you have already begun, and that has yielded almost, but not exactly, the information you need. Start with your nearly-but-not-quite-good page or site. You are going to search who has linked to that page– there is a good chance that those links can lead to to some even better information. Check out your results. With luck, you’ll find the information you seek!